Riding a snow mobile is so much fun but there are some unexpected things happened sometimes just like what we have experienced the other day. We followed the trails from our house and going back we decided to take a shortcut to the farm. We turned around and apparently our weight are so heavy between me, Jarred, and my husband along with the 300 lbs snow mobile. We got stuck on the snow with our snowmobile . It took about fifteen minutes to fix our problem. Daddy lifted up the end of the snow mobile and turned it around to direct the machine on the area with the packed snow so we can get back to the track. Haaayz...Thank goodness we made it. 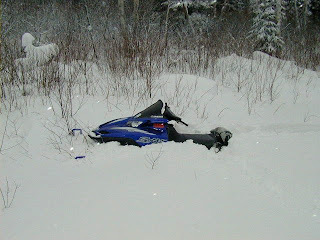 Rule of advice, don't get stuck in the snow with your snow mobile, it's so cold out there and it spoils your trip.